Change is in the air, as the dog days of summer are over…forever. Hold on to your gardening hats, because I have big news for you. After being a bachelor for most of my life, I am proud to announce that I got married last month and am now majoring in Adjustments 101. The most dramatic change I’m going through is swapping my life in the (rustic) dog house for one in the (refined) cat house. As you probably already know, I’m a dog person, owning terriers in particular. I’m not sure if I picked terriers because they remind me of myself, or if terriers picked me because I remind them of themselves— but make no bones about, I’m a terrier through and through. My terriers Acer, Mollie, Lizzie, and Sonny are fond of many things, including riding in the back of the truck and chasing and treeing critters like squirrels, possums, raccoons, and cats. 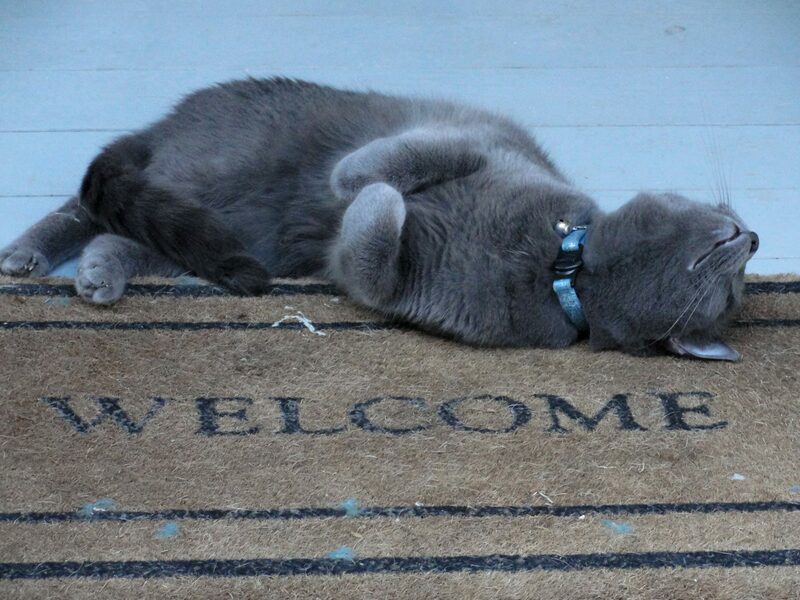 But oh do we have new tricks to learn, because we are now living with two cats (three counting my new bride). It’s sort of a Brady Brunch does the animal shelter episode. My two adopted girls are Minnie Douglas and Missy Mary. 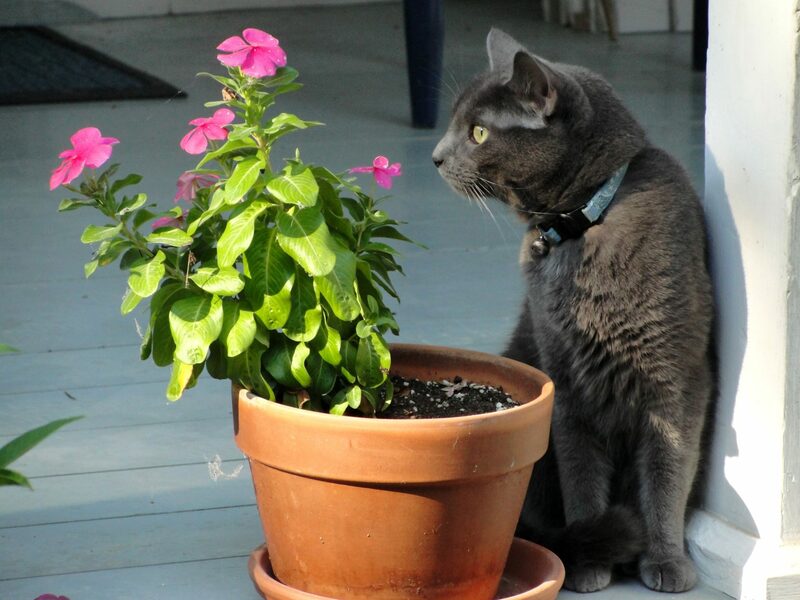 Although they are both young, Missy Mary is mature, contemplative, and gray. She’s still trying to figure out what happened and why her surroundings have changed so dramatically. Minnie Douglas, on the other hand, is a mischievous rule breaker hell bent on what she can stir up (or break) next. Minnie wants to be a pony, running free and kicking up her heals with the exception of when she’s in some unruly position in bed at night refusing to budge. Thankfully the cats are indoor cats and the dogs are outdoor dogs. But the cats want out and the dogs want in! I’m too busy learning my own new rules to worry about making new ones for them. 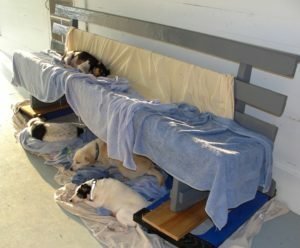 For years now I’ve dropped the dogs off at my parent’s ranch not far away during the day and kept them at night and on the weekends. This worked good as the pack loves to hunt all night and ride around in the back of the truck all day. But it turns out that Mollie likes to bark all night and my wife likes to sleep all night, so I switched to only keeping the boys here for guard dog duties. They get play dates with their sisters on the weekends. The new situation was working well until the cats had enough of the indoors and wanted to explore the porch to see the new sites. Then after about 30 seconds of that, they meandered into the garden to smell the roses, and then slipped under the gate into the perennial border to watch the fluttering bees, butterflies, and hummingbirds—all done while their canine siblings were spending time at Meemaw’s house. So, now we are coordinating dogs and cats like managing a broken stoplight at an intersection. In addition to knowing that dogs and cats don’t mix, I very well know that cats and songbirds don’t mix. So I’ll have to limit the feline activities to temporary excursions, making sure they don’t make a buffet out of my bird feeders and bird bath. Remember, my place is supposed to be a nature preserve! Luckily, our cats have spent most of their lives indoors or in a courtyard, so aren’t prone to hunting…yet. They also get fed frequently, so it’s not like they are hungry. 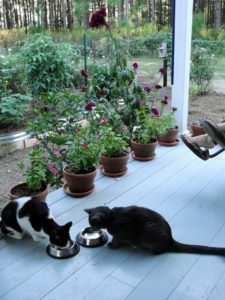 My plans are to screen in the porch so my wife and cats can relax there without getting bug bites and my house will stay cleaner – and at the end of it all, we will all have a nice place to enjoy. I’ll make sure the cats have plant stands and mini-jungles to bush-dwell in so the great-outdoors won’t be so tempting. I know it won’t be a permanent solution but it will at least help. After The Great Love Bug Plague of 2017, I was prepared to screen in the porch anyway…no more flies, dirt daubers, or eastern phoebes slopping mud on the walls. 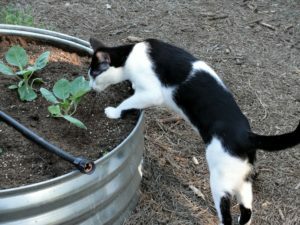 I’ll also make sure and cage all my vegetables in my galvanized fire-ring raised beds as I immediately noticed the cats loved trickling water from the drip irrigation and are fond of nibbling more than just catnip. Minnie immediately fell in love with parsley. I supposed sage, rosemary, and thyme are next. Welcome to Texas, welcome to the farm, and welcome to the team! PS: Mark your calendar for our Smith County Master Gardener Bulb Sale and Seminar Saturday October 14 at Harvey Hall (opposite the Tyler Rose Garden). It features a number of locally grown heirloom, hardy, and hard-to-find bulbs for the South, PLUS me lecturing on them! You can find more information about it on the Smith County Master Gardener’s Facebook page as well as my Greg Grant Gardens Facebook page. Congratulations!! 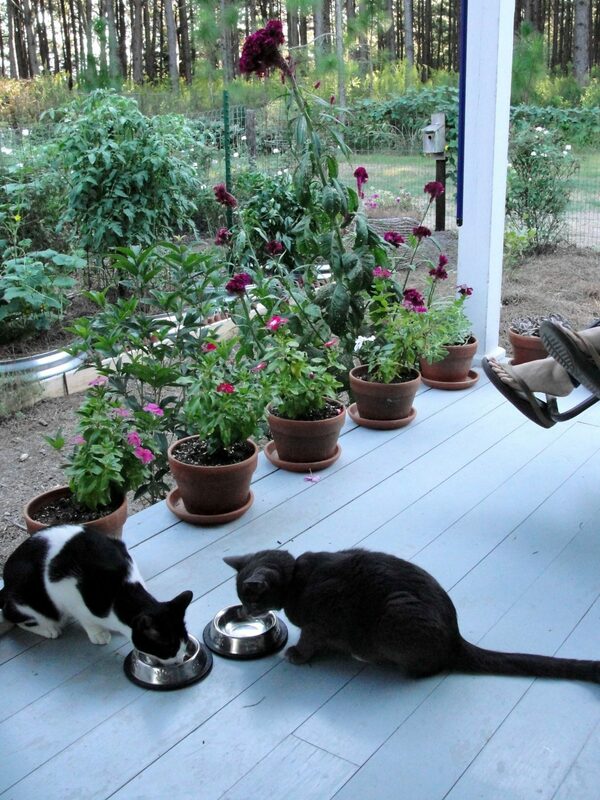 A new wife with two kitties...... How lucky can you be?